2. Mushroom confusion: Weight loss aid… or fad? 3. Is our honey filled with insecticides? 5. Plant foods and alkaline water for reflux? 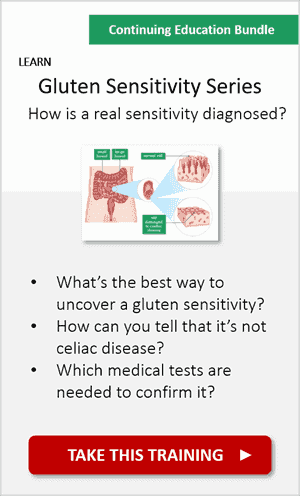 Do you know of any friends or family with a self-diagnosed gluten sensitivity? If you answered YES, then this is a must read! 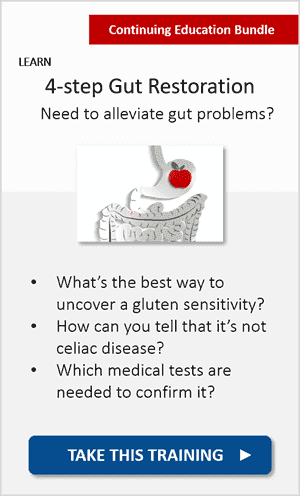 Self-diagnosed gluten sensitivities: Is gluten to blame? Or… could it be something else? (Skodje et al., 2017). In this new study, scientists questioned if gluten is to blame for the gut symptoms. Or…. could it be something else? To answer that, they recruited 59 participants who thought they had a gluten sensitivity. In case you were wondering, these participants were already on a self-imposed gluten-free diet. So, while keeping them on their usual gluten-free diets, the scientists added something: they sneaked in either gluten or fructans… How? By concocting (in the lab) muesli bars with specific amounts of gluten or fructans. But, what are fructans? And why use them in this experiment? Fructans are a type of fibre found in wheat and some vegetables (like onion, garlic, and asparagus). 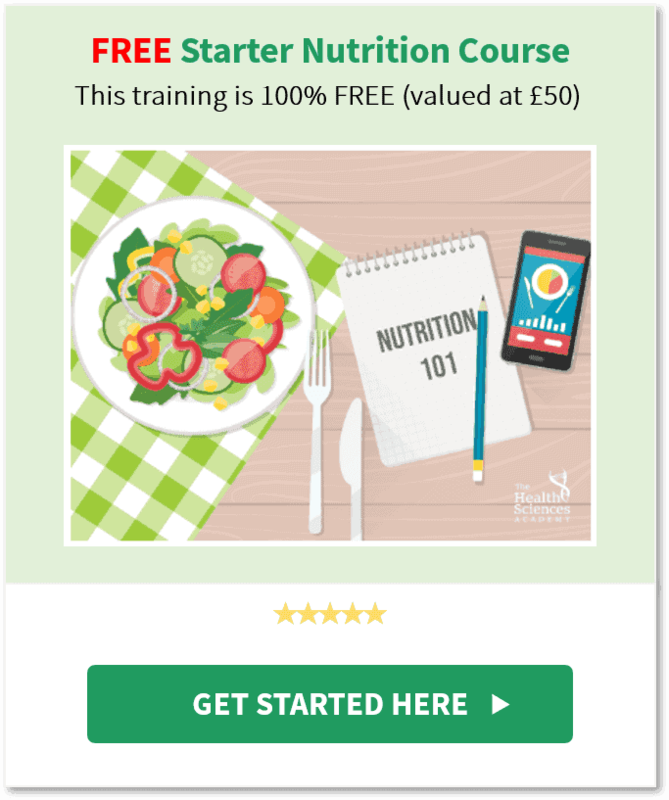 The reason fructans were used in this experiment is because they are thought to trigger symptoms of IBS – such as bloating, painful cramping, and constipation/diarrhoea. In fact, as you may already know, fructans are one of those fructose-oligosaccharides in the FODMAPs list (more here). The fructans in the study are from “inulin”, a type of fibre extracted from chicory roots and often used as a sweetener in food manufacturing. How so? 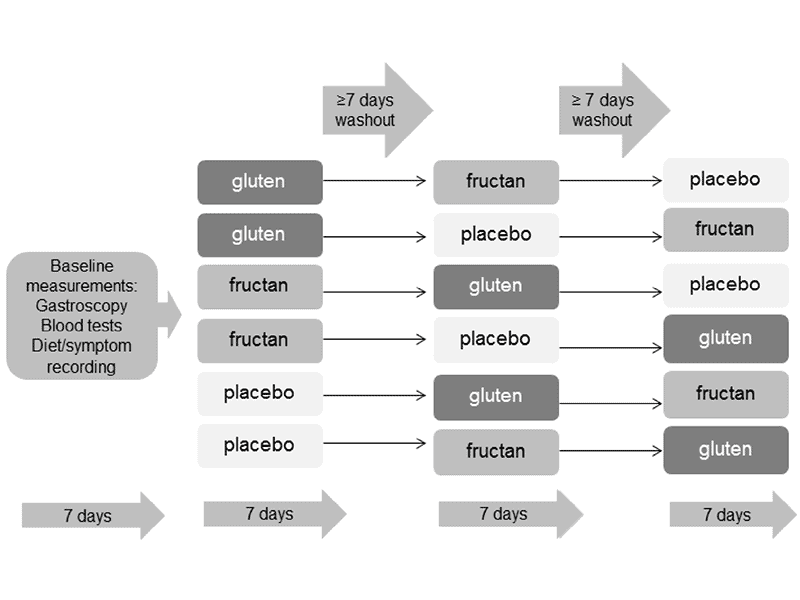 Participants who ate the gluten bars didn’t get as many symptoms, compared to those who ate the fructan bars. In fact, those who ate the fructan bars not only experienced more symptoms, but also those symptoms were more severe. So, how did the scientists assess the symptoms? 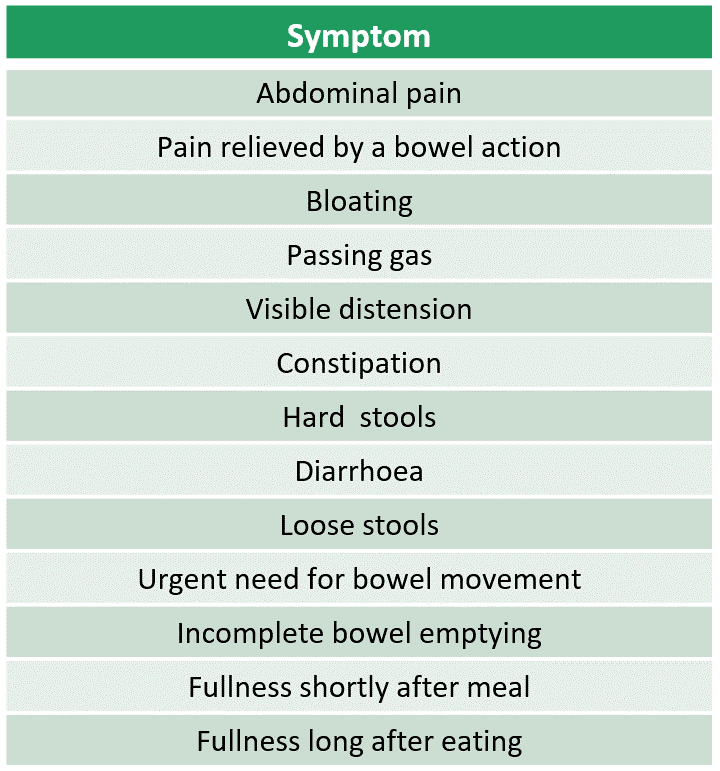 List of common symptoms that individuals with IBS may experience (Skodje et al., 2017). 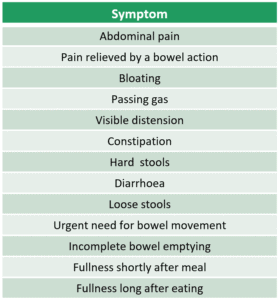 Using a Gastrointestinal Symptom Rating Scale (IBS version), participants rated their symptoms from ‘no discomfort’ to ‘very severe discomfort’. While this study shows that removing fructans may reduce symptoms in those thought to be gluten-sensitive, it still doesn’t prove that fructans are the sole culprit or the only cause. Note: The diagnosis of gluten sensitivity is not straight forward, in particular when FODMAPs are involved… If you want to learn the right way of doing this, see our Science Report: How is Non-Coeliac Gluten Sensitivity diagnosed? (optional resource). Mushroom confusion: Weight loss aid… or fad? 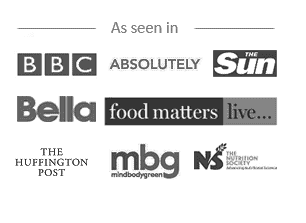 Even the Daily Mail reported it: “Starting the day with mushrooms could help you shed pounds from your waistline”. But… does this hold up to the facts? Let’s look at the study that fuelled this news story! 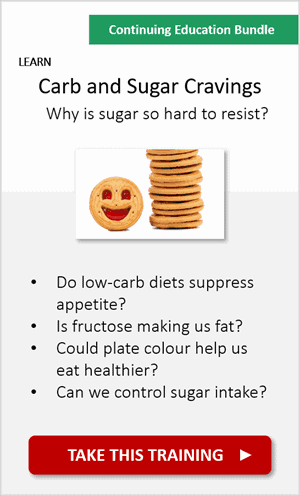 To start with, researchers investigated satiety… and not weight loss (ahem). Satiety is the feeling of fullness that stops us eating more. 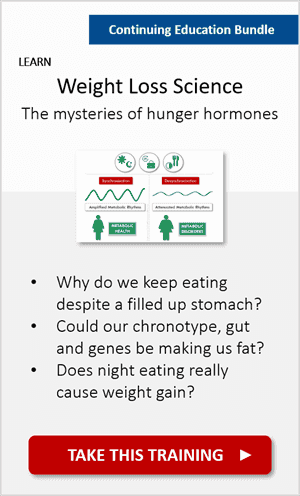 Maximising feelings of satiety (or fullness) may help reduce unwanted hunger-pangs. Mushrooms are high in fibre and low in calories, and have a protein quality rating higher than grains. That’s why, in this study, the scientists tested a mushroom breakfast vs a ground-beef breakfast. So, which breakfast got the highest satiety scores? While the amount of calories consumed at breakfast were the same, the mushroom eaters felt fuller for longer. Why could that be? The questionnaire revealed that participants had significantly lower hunger scores, increased fullness and decreased prospective consumption after the mushroom breakfast, in comparison to the meat breakfast (Hess et al., 2017). First off, the volume of mushrooms was greater, meaning that the amount of time spent chewing was likely increased, and research suggests that chewing for longer promotes fullness. 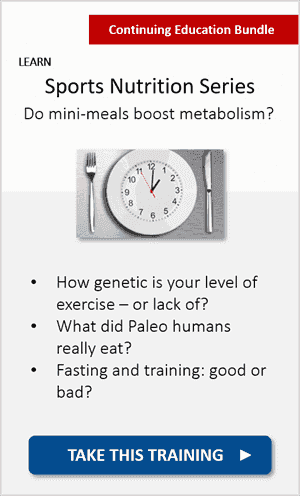 …both effects increase satiety as shown in previous research. Eating mushrooms didn’t result in fewer calories consumed later in the day. In the meantime, we do know that adding mushrooms to meals could help with appetite control. So if you like mushrooms (and don’t mind a slower digestion! ), this could be a handy tactic to keep in mind. Note: Ever wondered why sometimes we keep eating despite feeling full? And what does feeling full mean anyway? 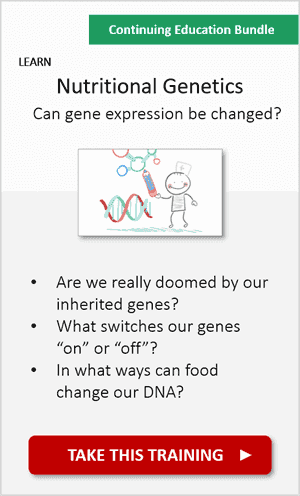 Grab our Science Report Full Yet Hungry Part 1 to start unravelling these mysteries (optional resource). Is our honey filled with insecticides? Let’s dive into the actual study that triggered this news and set the record straight. 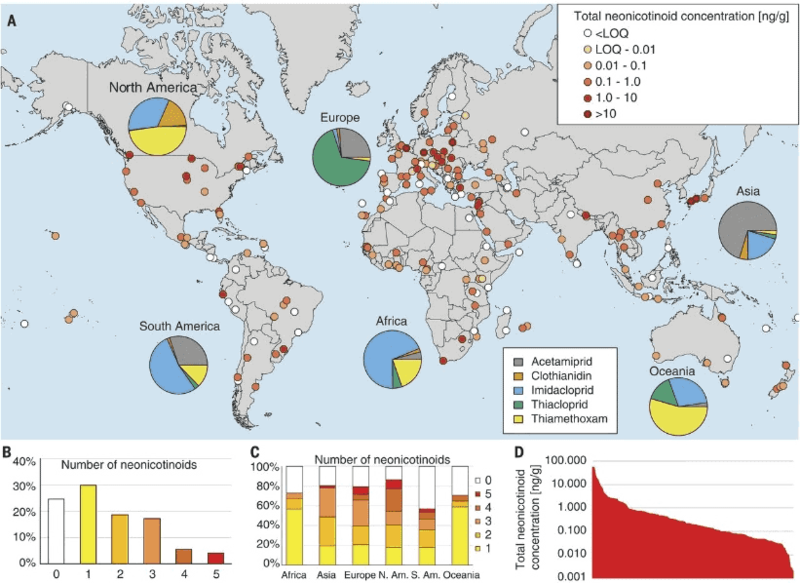 Researchers analysed 198 honey samples from across the world, looking for five of the most common neonicotinoids (a class of insecticides). 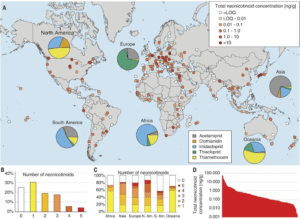 Concentration of insecticides greatly varied across the honey samples collected from different regions of the world (Mitchell et al., 2017). They found measurable amounts of at least one type of neonicotinoid in 75% of honey samples, with the highest amounts of contamination in North American samples at 86%! But how do insecticides get into our honey? And what does this mean for our health? Neonicotinoids, applied to crops, are passed into plants and flowers, eventually contaminating the pollen and nectar that will go on to form the honey. But, should we really be afraid and… bin our honey jar? The researchers revealed that the levels of insecticides in the samples didn’t exceed toxicity thresholds (in the EU, these thresholds are 10-50 nanograms per gram of honey, depending on the type of neonicotinoids). Put simply, there’s no risk to our health at these trace levels. The results indicate that our little “honey producers” can be harmed by infinitesimal doses of neonicotinoids (as low as 0.10 nanograms per gram), which in turn may have a negative impact on ecosystems. It’s no surprise that, following this study, calls are being made for agriculture authorities to reassess the use of insecticides and help save honey bees. 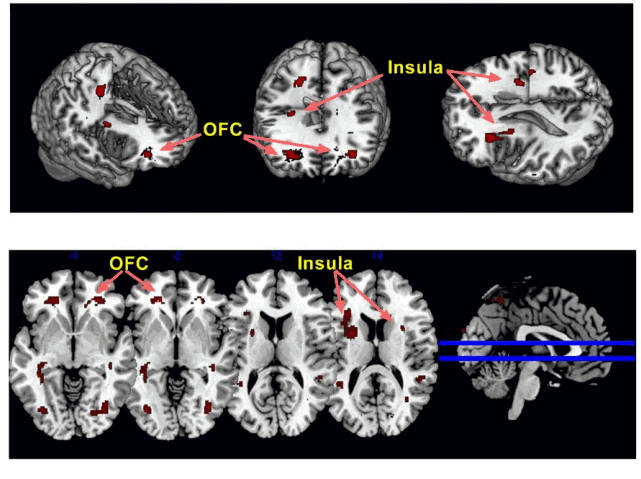 Capsaicin intake enhanced the detection of salty taste in the insula and orbitofrontal cortex (OFC), which reduced the subjects’ preference for salt (Li et al., 2017). Many of us enjoy adding salt to our meals to enhance their flavour. But you’re probably aware that, for some, not letting go of the salt shaker may raise blood pressure and their risk of heart disease, a major killer in the developed world. However, could spicing up our cooking work out as a potential strategy to curb our salty addiction? Whether you love chillies or not, you will want to read on! A new study from China (using data from 606 individuals) reported that subjects who enjoyed spicy foods had lower salt intake and lower blood pressure compared to those who disliked spicy flavours. The researchers tried to explore the answer to this question by scanning the brains of 60 participants using MRIs. They focussed on two brain regions associated with salt perception – the orbitofrontal cortex and the insula. As expected, a salty solution given to the participants increased activity in these areas. This activity was more pronounced in individuals with a higher liking and daily consumption of salt. When capsaicin (the pungent component of chillies) was given with the salty solution, the brain regions activated by capsaicin overlapped with those activated by salt. This meant that the spicy flavour enhanced the brain’s response to salt. Capsaicin heightened the pleasurable response to salt (via the overlap of brain activation). The scientists suggested that, if spicy flavours increase our sensitivity to salt, we could use less salt but gain the same enjoyment. In this case, less could mean more! They went on to propose that the addition of spicy foods to our diet could be a potential behavioural intervention to tackle hypertension and the development of heart disease. However, the effectiveness of such a strategy still needs to be confirmed in a larger intervention study and with real foods, e.g. chilli peppers and salty dishes. Until then, next time you cook, try adding a bit of chilly and less salt! Plant foods and alkaline water for reflux? Have you ever suffered with acid reflux or heartburn? Well, you may be aware that this common problem is often dealt by over-the-counter or prescription Proton Pump Inhibitors (PPIs). They work by blocking gastric-acid secretion but may also cause some side-effects such as nausea, headache and constipation. There are also concerns about possible negative effects in long-term use. American Researchers looked at the medical records of 184 people with laryngopharyngeal reflux – i.e. acid reflux that reaches the throat. Out of this group, 85 were treated with medication (PPIs), whilst 99 were given a special diet for 6 weeks. What kind of diet was this? It was a plant-based Mediterranean-style diet where participants ate mostly vegetables, fruits, whole grains, and nuts… And only drank ultra-alkaline water. You might have heard a lot about plant-based diets (as well as the controversial alkaline water! ), but why did they choose them here? Pepsin is a digestive enzyme produced by the stomach to help break down the proteins that we eat. However, when stomach contents are refluxed up to the throat, pepsin can linger in the airways and cause inflammation. Nasty, right? Because pepsin activity is thought to decrease with plant-based eating, the researchers wanted to see if this would help with reflux. Similarly, ultra-alkaline water (above pH 8.8) has been reported to benefit acid reflux sufferers thanks to the inactivation of pepsin. So, what happened after this 6-week diet? 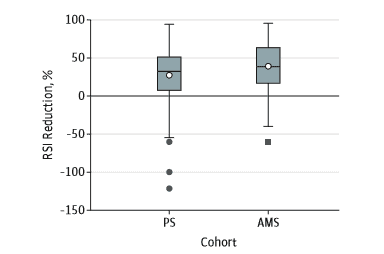 The plant-based Mediterranean diet group (AMS) achieved slightly superior percentage reductions in Reflux Symptom Index (RSI) compared to the Proton Pump Inhibitor treated group (PS), but the results were not statistically significant (Zalvan et al., 2017). As suspected, the plant-based eating and the ultra-alkaline water were as effective as the PPIs treatment in reducing reflux symptoms. For this reason, the researchers believe that acid reflux sufferers could perhaps attempt a plant-based Mediterranean-style diet and alkaline water before taking PPIs. This is promising news for those with reflux issues, because PPIs have several side effects and have been associated with B12 deficiencies and osteoporosis – besides being one of the most prescribed medicines in the UK! While we expect more trials confirming these findings, it’s interesting to see some new benefits behind the inclusion of plant-based foods. Note: Some individuals may abruptly shift to plant-based eating without much thought… but this can increase the risk of developing severe nutrient deficiencies. 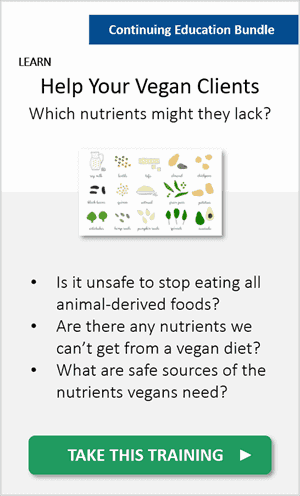 To get your head around preventing these problems, we’ve got the perfect Science Report which you may want to explore: Veganism 101: Which Nutrients Might Vegans Lack? (optional resource). Hi there Alex, in reading your article on acid reflux – it brought to mind a number of clients that I have seen all with this issue. Have you heard of the work of Andreas Moritz and specifically this Amazing Gallbladder and Liver Cleanse. I personally did a series of liver cleanses and passed 1000’s of stones. I have been a vegetarian for 23 + years and quite a healthy lifestyle so I was quite surprised at just how many stones I passed. I have recommended liver cleansing and those that chose to do so- found not only did they have stones, but the acid reflux stopped. I’m hoping this perhaps will be of use for you in your research and linking all these things together. Hi Amber, I hope you enjoyed the article! It was interesting to read your comment, and I’m glad to see our content on acid reflux has struck a chord with you. Regarding our using your findings in our research, everyone’s bodies are different and applying a one size fits all “cleanse” can be extremely dangerous! Even if these fads seem to make a difference for some people, there’s no telling the damage this is doing to someone else internally… That’s why we only go by our critical analysis of peer-reviewed scientific research, and never the words of book authors or gurus. Interesting about the ultra alkaline water. However, it’s my understanding that stomach acid is important for mineral absorption. Putting that much of a strong base into the stomach would neutralize that acid, possibly as fully as PPIs. Too bad that the study didn’t separate the dietary and alkaline water components of the experiment. Indeed, Michael – that’s the risk of PPIs. We won’t know if ultra-alkaline water has similar effects until we see more research.